Videoslots Casino has been added to the recommended list of casinos today, this is a casino that’s been up and running for a number of years now originally founded in 2011 and has improved hugely in all aspects of what makes a good casino to play at, as the name suggest this is a casino that is heavily focused on online slots. 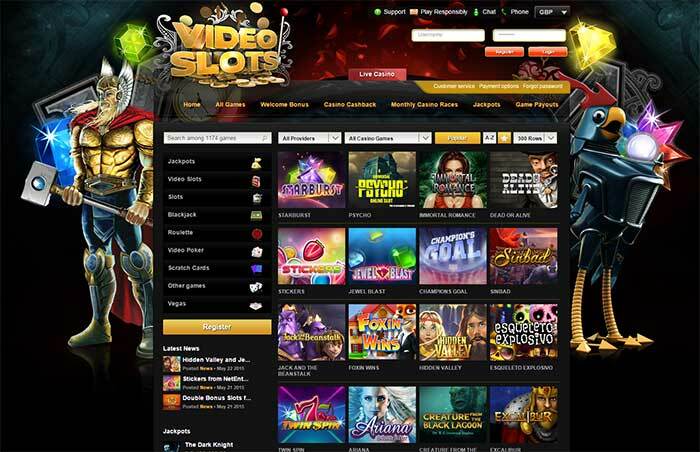 Videoslots casino has one of the hugest catalogues of slots and games available online, at the time of writing they have a staggering 1174 games available from 22 providers (in 2018 there is now over 2200 games to play!). Players will find a comprehensive selection of online slots from providers such as NetEnt, Microgaming, Nextgen, Aristocrat, Play’n Go, Betsoft and Playtech and of course a whole host more. Videoslots Casino also has a fully functional mobile casino which has an ever-expanding range of mobile-friendly games to play. Videoslots Casino also has a really interesting game payouts section with lots of real RTP information, where players can check to see which slots are currently the hottest in terms of payout, with numerous filters also available you can see lots of great information about which slots are giving good and bad returns. The casino has a great selection of game filters available in the casino allowing you to easily find your favourite slots with filters available such as by provider, type of slot, A to Z filter as well as a search function. The casino has a wealth of great features including the recently introduced feature which allows players to load up and play multiple slots simultaneously, along with this great feature players will find a whole host of regular promotions including a unique weekender booster system, monthly casino races with great prizes on offer as well as a comprehensive achievements system which rewards players for unlocking various achievements in the casino and slots. With such a great selection of slots, great player focused promotions and ongoing rewards, bonuses, and the weekend booster it’s definitely a casino worth having a look at if you are looking for a new casino to try out. Videoslots casino offers several great promotions for new players, first, you can claim 11 Welcome Spins simply for signing up with no deposit required, players then have the ability to claim £10 extra cash on your first deposit. And of course with your first deposit you also have access to a great 100% up to £200 sign-up bonus, the wagering on this bonus is just x20 bonus making it very competitive, we must state for players though the way the bonus works is slightly different to a lot of other casinos and one you might not be used to. The bonus money gets paid out in 10% increments, for example, if you deposit £100 you will have a £100 bonus, after you have wagered £200 you will receive a bonus payout of £10 to your cash account, as you wager more money the additional bonus funds are then added to your account. We think its a fair compromise having a much lower wagering requirement (x20 bonus) and this method of unlocking the bonus cash as you wager your money, along with being able to withdraw real money at any point. Videoslots Casino offers a huge range of deposit and withdrawal methods and are noted for their super fast payment speed particularly to players using e-wallets, players will find deposit options such as Visa, MasterCard, Maestro, Ukash, Paysafe card, Neteller, Skrill and ECO. Customer support features a comprehensive FAQ that covers all the basic questions players require, as well as customer service in form of instant chat facility this is available around the clock, email support and phone support.